It seems like it has been rainin’ for forever ’round here! Those old thunderstorms have been rollin’ through and bringin’ gully washers with it, makin’ the yard a muddy mess. I may be a country girl, but I don’t like gettin’ my feet wet or gettin’ dirty. But, I got to say, my Lady has had her hands full with them siblin’s of mine! Them big ole pups go splashin’ through every mud hole they can find. 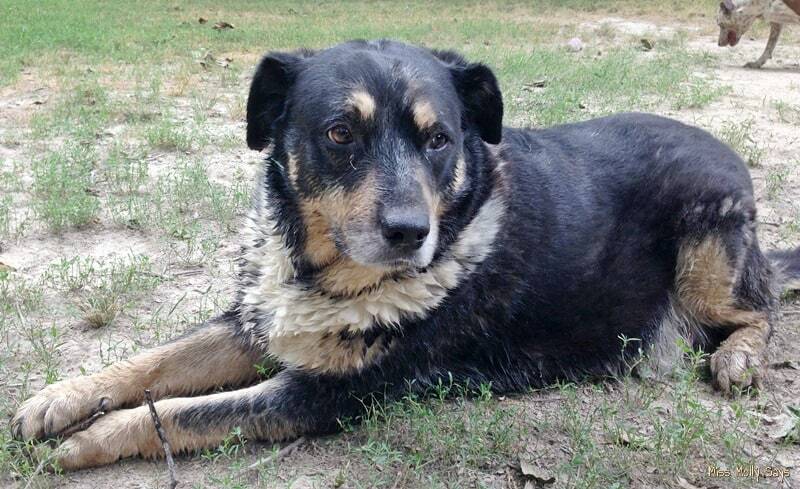 Big ole Ozzy comes to the door with mud squishin’ ‘tween his toes! My Lady does her best to clean em all up ‘fore they go inside, but there just ain’t no gettin’ rid of all that mud and dirt WOOF! My Lady fusses ’bout the muddy tracks all the time, but she uses Spot Shot® Instant Carpet Stain Remover to help her keep up with the stains and ground in dirt! I don’t know all that much ’bout cleanin’, but I know my Lady needs quick and easy. After all, she has 7 of us pups to keep up with and clean up after. All this talk about cleanin’ done made me tired. Lemme fetch my Lady to tell ya more ’bout it while I mosey on over for a nap! Miss Molly is right! These big brutes can spot a mud hole a mile off and head straight for it! Not only is the mud on their feet, but all up their legs and stomach. Talk about a mess! It is a full-time job just trying to clean them up a little to come back inside during the rainy season. Needless to say, the carpet does not fare well! 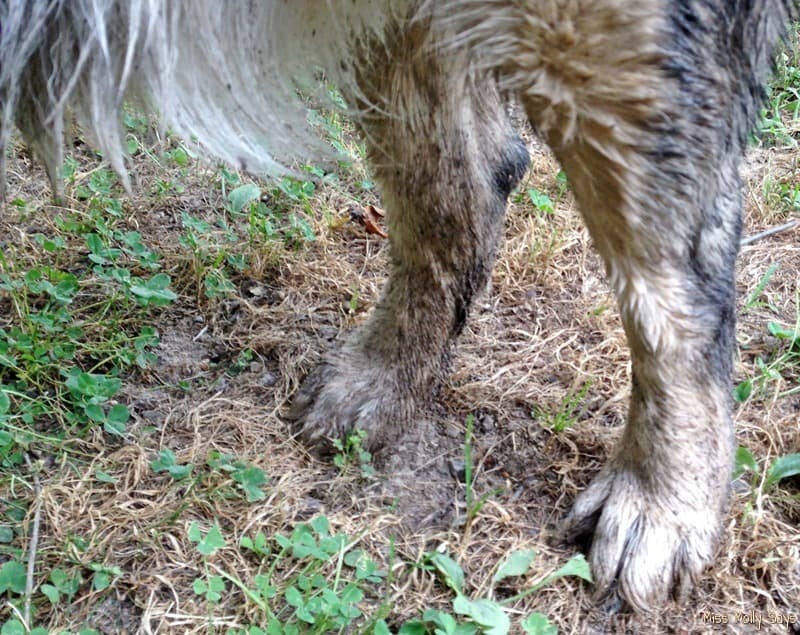 From dirty, muddy paw prints to the places they lay, there is ground-in mud stains. On days it isn’t raining, I still cannot escape the water and mud mess! 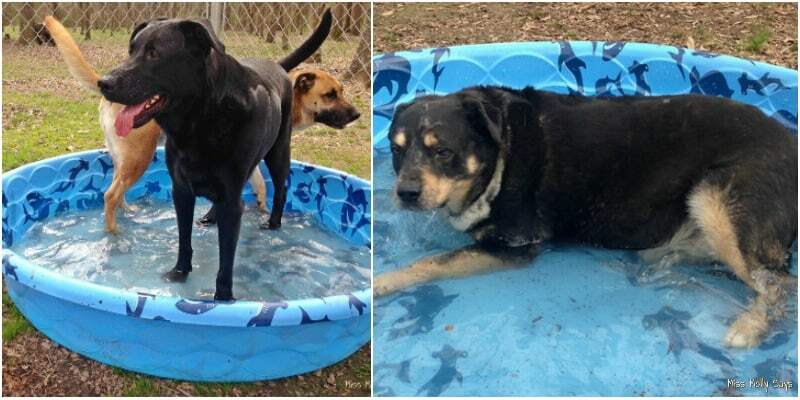 The pups want to go play outside where they have a kiddie pool they love to play in! The problem is, grass is scarce in our back yard, as there are too many shade trees for it to grow. And, as luck would have it, that is just where they want to hang out at. They jump in the pool, splish, splash, and just generally hang out. Who doesn’t like to hang out in the pool on a sweltering hot day?! But then, they get out and lounge around in the dirt chewing on sticks or watching the world go by. When it is time to come back inside the house, they are a BIG, DIRTY, MUDDY MESS! Wet Dogs + Dirt = Muddy Dirty Dogs and Carpet Stains! It is a never-ending cycle and enough to make you want to pull your hair out – except they leave enough of that throughout the house to clean up too! We won’t add to it! Anyway, you can imagine the mud and dirt stains that happen from everyday living with 7 big dogs! That is why I love my Spot Shot Instant Carpet Stain Remover! I am NOT fond of cleaning, even though I have to do more than my share of it. 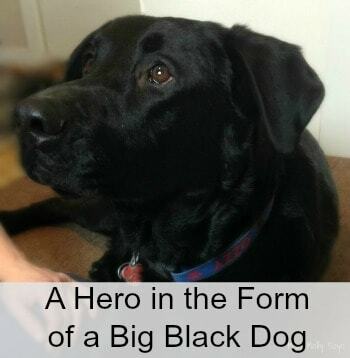 Keeping up with 7 large rambunctious dogs is not for the faint-hearted! I have enough trouble keeping up with the never-ending hair supply and I don’t want to be on my hands and knees trying to scrub out all the stains they can produce! Spot Shot is my secret weapon! It has a formula that penetrates deep into carpet fibers breaking the physical bond of stain particles and odor molecules from the carpet fibers and pad, allowing them to be easily blotted out of your carpet without rubbing, scrubbing, or vacuuming! Hallelujah! 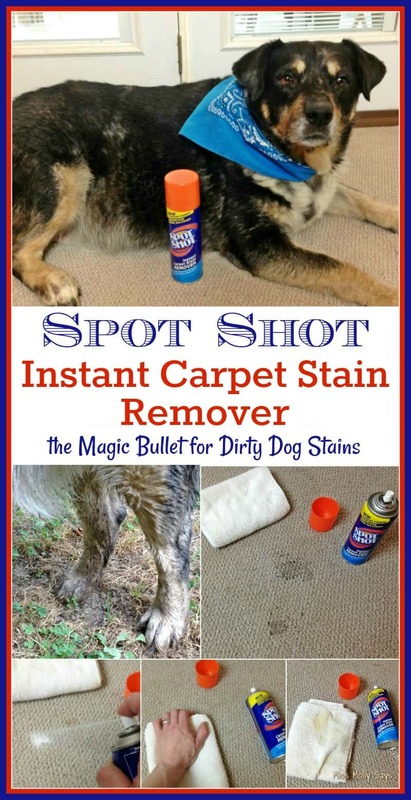 Spot Shot Instant Carpet Stain Remover works on NEW AND OLD stains! I love how easy it is to use! It saves me time and headaches! All you have to do is spray Spot Shot on the stain, wait a few minutes, and then blot the stain away! There is NO SCRUBBING REQUIRED! If it is an old stubborn stain, you may have to repeat the procedure, but that is simple enough to do. It’s powerful cleaning agents do all the work for you! You can then blot with a damp cloth to remove any residue left behind. How Does Spot Shot Work its Cleaning Magic? Spot Shot Instant Carpet Stain Remover penetrates deep into carpet fibers. It then goes to work breaking up the stain and odor and you can simply blot the stain away! Brilliant! Is it Safe Around Pets and Children? Spot Shot can be used around your pets and children. I would recommend following through with the blotting of a damp cloth to remove any residue after cleaning of the stain. 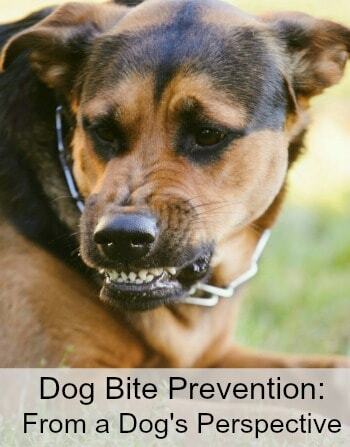 Then, keep pets and kids away from treated areas until they have dried completely. Does it Work on all Carpets? I have not had a problem with using Spot Shot Instant Carpet Stain Remover on my carpet. However, with that said, you should always do a colorfast test to make sure before use. Try it in a hidden area of the carpet and allow to dry completely, over 12 hours. If you see any color change, don’t use. But, like I said, I have not had a problem at all. 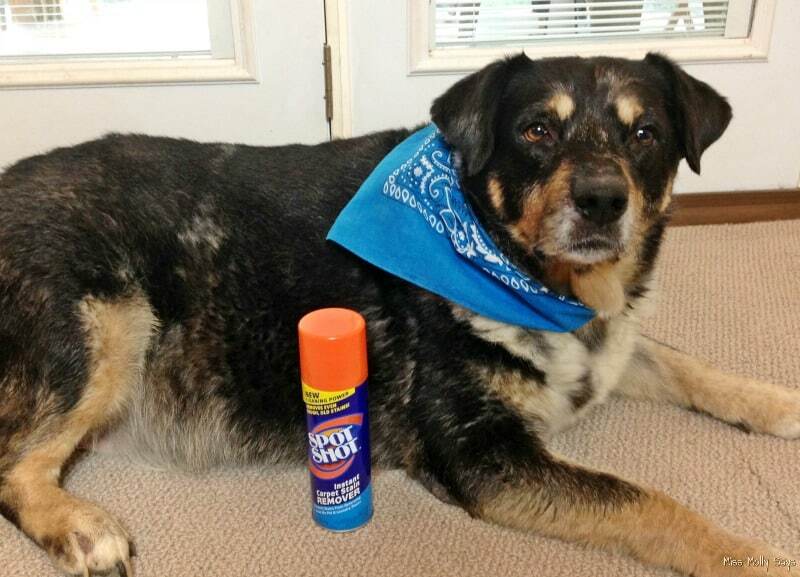 I told you my Lady knew the solution to muddy paw prints and pet stains! WOOF! 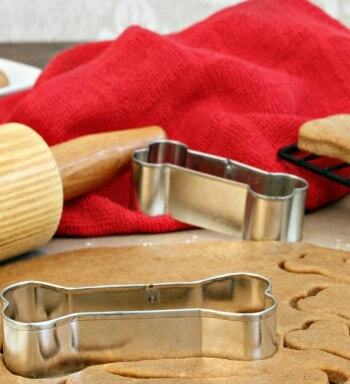 Are you battling tough pet stains in your home? Silly question, right? 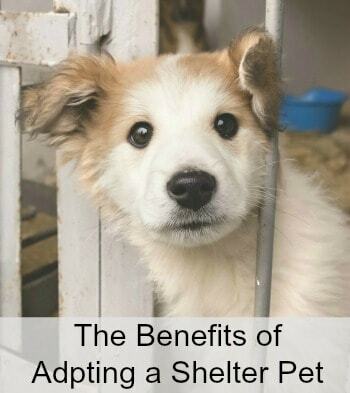 Because if you have pets, we already know the answer! You really NEED Spot Shot in your cleaning arsenal! Spot Shot Instant Carpet Stain Remover can be found online and in stores nationwide like Walmart, Ace, etc. In my town, my local True Value store carries it. To find a store near you, or online, you can use their handy “where to buy tool“. You can also grab a money-saving coupon to get $1 off Spot Shot! I also recommend joining the Stain Fighting Community on Facebook for all the latest cleaning tips and tricks! It has a wealth of handy information that will help you combat the housecleaning blues! Great, would really be useful especially because my cat is throwing up everyday on the carpet.. 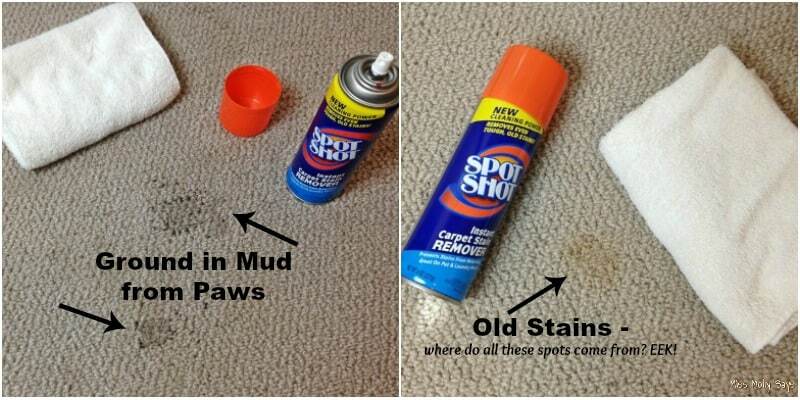 I am always using spot shot for stains from pets as well as grandkids and it always seems to work well. Always have a can in the house. That looks like it may come in handy. Thanks. I do find that by taking a few minutes to use the spot shot when necessary, it is easy to keep things from getting to grungy. I’ve been wanting try Spot Shot, Thanks for the review, it was very helpful, now I can buy it and use it. I have used that product before and it does work good. My dog loves to play in the lake in the summer, but he gets so dirty! I would love to try this carpet stain remover! This was super helpful. We have two dogs and a cat, so our carpets get some abuse. Thank you for this post! spot shot is all I ever use! It works! 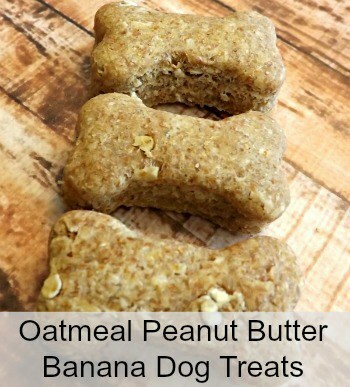 This product would be great for someone with many dogs or when training a puppy. I will have to write the name down in case we ever need it. I will have to try this out, definitely have been looking for a good carpet cleaning for when the cats throw up. The product sounds great, I know some people who own a dogs or two. 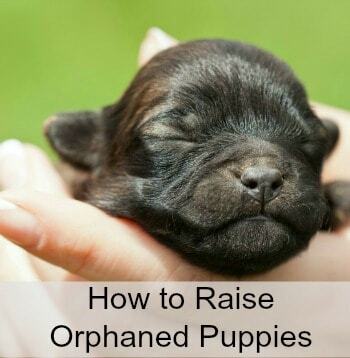 This may help them . My poor pup has had a few “mistakes” on the carpet. I need to get a can of this! Sounds like it would be great for cat hairball stains. Seems to be a good stain remover for people with pets that make their home messy. This would be a lifesaver for me. My pup is always brings muddy paws into the house. Spot Shot is the only stain remover I will use. Looks like a good product. Nice that it works well. I always want a dog like this!!!!!!!! I relatively don’t normally have issues with pets making messes but good to know. I’ve used spotshot and it does work well. I’d also suggest that you buy a hoover carpet cleaner. I have one and use it often for those inevitable pet messes. My carpet has never looked better! I am always looking for ways to get rid of stains and odor. Great review, thank you. I have four dogs and if one has an accident in the house the others think it’s okay for them to also. I could really use about 10 cans of this stuff. 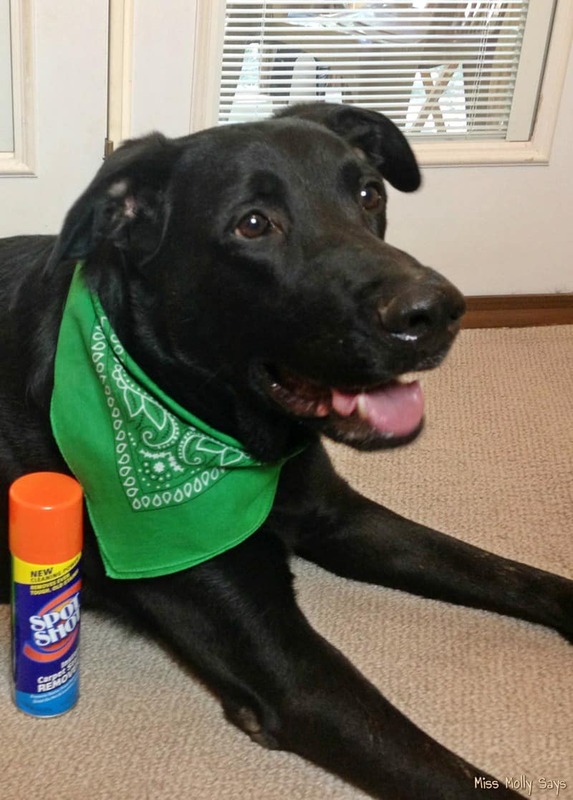 Sounds like the perfect arsenal for battling pet stains! We have two kitties who feel it is their duty to throwup often to make sure I know which canned foods they like best. This would be very helpful. What a super cute dog and thank you for introducing this product. My sister liked Spot Shot and she got me started using it and now that is all I use. This looks like a great product for any carpet stain. It seems to work well! We have cats and a dog, so this seems like a worthy product to try, as long as it’s safe . I have 4 dogs, a cat, and a 5 yr-old grandbaby. I always have stains. Gonna have to give this a try. I wish I’d had that in the winter! We are on a farm so that would have been handy! 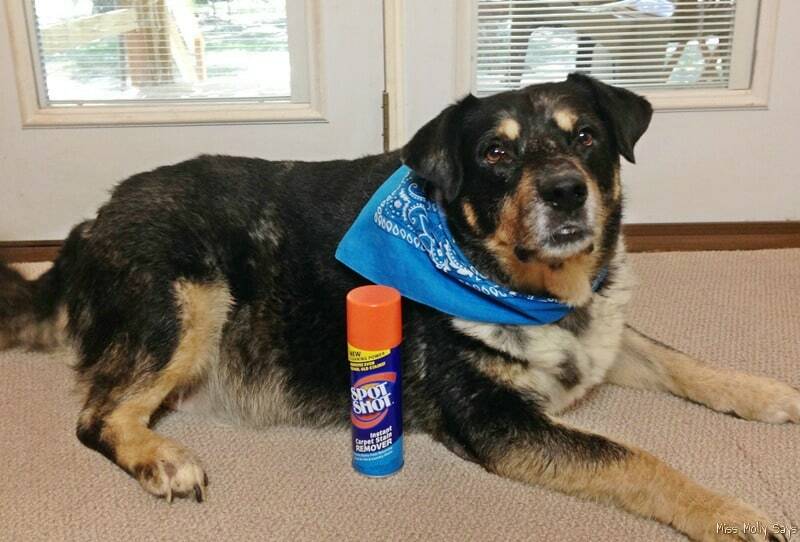 I am always looking for products that remove pet odors and stains from my carpets, I will have to look for this one.